The imaginary voice of the Transportation Security Authority, @TSAgov overrides our fear of flying and gets to the root of our anxiety: why does the TSA want to pat us down so badly? 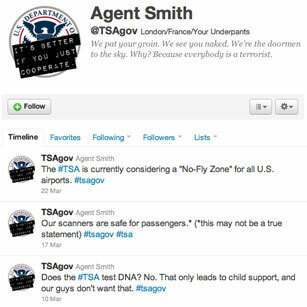 This anonymous feed gives a glimpse into how the TSA thinks  or really, how we imagine it thinks. The ominous tweets are one part high school bully, one part voice of God and all parts hilarious. The threats are so sinister and over the top that they almost dispel our fear of being stopped in the security line.